In the last decade, plugins such as Flash and Silverlight have enabled a rich consumption of video in browsers, powering popular services such as YouTube and Netflix. However, this approach has shifted towards HTML5 over the last few years. Almost two years ago, the W3C published the final recommendation of the HTML5 spec, which came with a new set of HTML elements and APIs, especially for video. Some of them aim for more semantics in web pages but don’t introduce new features. Others extend the possibilities of the web and enhance the possibilities for developers without the need for plugins such as Adobe Flash, Microsoft Silverlight or Java. In the last decade, plugins such as Flash and Silverlight have enabled a rich consumption of video in browsers, powering popular services such as YouTube and Netflix. However, this approach has shifted towards HTML5 over the last few years. Almost two years ago, the W3C published the final recommendation of the HTML5 spec, which came with a new set of HTML elements and APIs, especially for video. Some of them aim for more semantics in web pages but don’t introduce new features. Others extend the possibilities of the web and enhance the possibilities for developers without the need for plugins such as Adobe Flash, Microsoft Silverlight or Java. This is especially important because, for example, Google has announced the removal of NPAPI (an API used by these plugins), as has Firefox, and Microsoft advocates for plugin-free browsing. Although these vendors still provide a Flash player, it is probably only a matter of time before they don’t. Furthermore, browsers on mobile devices are a step beyond because most of them do not support plugins and have no Flash player. <video> enables out-of-the-box playback of video, which is really awesome. This finally makes plugin-free multimedia on the web a reality. In fact, browser vendors seem to agree on a single format — MPEG-4/H.264, which is universally supported in modern browsers, with a notable exception of Opera Mini. <audio> enables out-of-the-box playback of audio content on a web page. As with video, the decision of which container formats and codecs to support is left to browser vendors. <track> can be used for timed text tracks, such as subtitles and captions in a video. WebVTT files are supported out of the box. Most of the new elements have been known about and used for a while in HTML5 video player code because they are implemented in all modern browsers. The specification is stable. Still, the W3C has a lot of work to do left. We welcome the new standard and look forward to the time when we don’t need a Flash player or plugin, when multimedia can be viewed on virtually any device with a single implementation. Let’s look into the MPEG-DASH streaming format and why it is used in HTML5. MPEG-DASH (the DASH being short for dynamic adaptive streaming over HTTP) is an international, vendor-independent standard ratified by MPEG and ISO (ISO/IEC 23009-1). Previous adaptive streaming technologies — such as Apple HLS, Microsoft Smooth Streaming and Adobe HDS — were released by vendors with limited support for vendor-independent streaming servers or for playback clients. 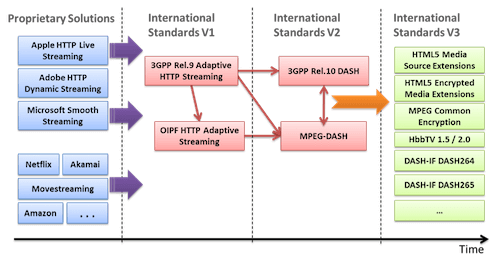 A vendor-dependent situation was clearly not desirable, and so standardization bodies started a harmonization process, resulting in the ratification of MPEG-DASH in 2012. Reduce startup delays as well as buffering and stalls during video playback. Continue adaptation to the bandwidth situation of the client. Use client-based streaming logic to enable the highest scalability and flexibility. Use existing and cost-effective HTTP-based CDNs, proxies and caches. Efficiently bypass NATs and firewalls through the use of HTTP. Enable common encryption through the signaling, delivery and use of multiple concurrent DRM schemes from the same file. Enable simple splicing and (targeted) ad insertion. In recent years, MPEG-DASH has been integrated in new standardization efforts — such as the HTML5 MSEs, which enable DASH playback via HTML5’s video and audio tags, as well as the HTML5 Encrypted Media Extensions, which enable DRM-protected playback in web browsers. Furthermore, DRM-protection with MPEG-DASH is harmonized across different systems with MPEG-CENC (for common encryption); and MPEG-DASH playback on different smart TV platforms is enabled via integration with Hybrid Broadcast Broadband TV (HbbTV 1.5 and HbbTV 2.0). Also, usage of the MPEG-DASH standard has been simplified by industry efforts around the DASH Industry Forum and its DASH-AVC/264 recommendations, as well as by forward-looking initiatives such as the DASH-HEVC/265 recommendation on the usage of H.265/HEVC within MPEG-DASH. Today, MPEG-DASH is being deployed more and more, accelerated by services such as Netflix and Google, which have recently switched to this new standard. With these two major sources of traffic, MPEG-DASH already accounts for 50% of total Internet traffic. How Do The MSEs Work? Download and parse the manifest file — called an MPD in MPEG-DASH — which describes the video stream’s details, such as the number of the video stream’s quality levels and resolutions, audio languages and subtitles, as well as the name of the media segments and files on the HTTP-based origin server or CDN. Decode and render the video via the video tag, typically in the hardware. This is how HTML5-based adaptive streaming players work, as used by Netflix and YouTube. There are already quite mature solutions out there, which makes it easy for developers and content providers to switch to adaptive bitrate streaming in HTML5, such as the DASH-IF open-source project dash.js and the Bitdash HTML5 player. However, use of the MSEs is not limited to MPEG-DASH. More and more projects (including hls.js) and players (including Bitdash) support Apple’s HLS format in HTML5 using the MSEs. They do this by trans-multiplexing the HLS media segments — which are MPEG2-TS containers — to the ISO Base Media File Format required by HTML5 and MPEG-DASH. Major changes are currently happening in the DRM market, caused by the imminent drop of NPAPI plugins — such as Silverlight, which led to the drop of the leading DRM system, PlayReady — from Chrome and Firefox. This puts nearly all premium content providers in a tough situation because they will have to switch technologies and find a future-proof solution. Premium streaming media publishers will not be able to rely on Microsoft’s PlayReady DRM to secure their content in Chrome and Firefox on PC and Android devices. They will have to re-evaluate their content protection and streaming platform strategy and will have to find a future-proof solution and then switch technologies shortly. For many content providers, MPEG-DASH has emerged as the technology of choice. DASH projects have rolled out at an accelerating pace, and MSEs and Encrypted Media Extensions (EMEs) with Widevine DRM look to be the most viable alternative. Also, MPEG-CENC makes it possible to support separate DRM systems with just one version of protected content, and EMEs are based on the MSEs for MPEG-DASH-based content. So, this combination of different DRM systems — for example, Widevine Modular for Chrome and Android, Microsoft PlayReady for Internet Explorer and Edge, and Adobe’s Primetime for Firefox — for one version of a piece of content gives content providers additional incentive to move towards MPEG-DASH as an international standard, given its flexibility with streaming, DRM and CDNs. After a couple of years of slow adoption by browser vendors of HTML5 and the MSEs in particular, we are now seeing a majority of them supporting it. This also goes for EMEs, although in this case each vendor is going for a different DRM system, and the ecosystem is a bit more differentiated. However, to reach 99% of users, we have to have a video streaming setup that also supports browsers that don’t support the MSEs, in particular old browser versions and Safari on iOS. Old browsers can be served easily using a Flash-based player, which can play back the same MPEG-DASH content that is used by the MSEs, as shown by the Bitdash player. To support iOS devices, we have to use Apple’s streaming format, called HLS, which Apple is mandating for HTML5. Open standards such as the MSEs are not supported by Apple, although they are supported on Safari on OS X. New media codecs are pushing into the market, making video compression even more efficient, which is especially important for higher-quality formats such as 4K and UHD and for streaming to mobile devices. The most common codec is HEVC/h.265, which could be the default codec in a couple of years from now (if the patent situation doesn’t mess that up). And it will also utilize the browser’s built-in MSEs for playback and use MPEG-DASH as the streaming format, which shows the flexibility of this open standard. Developers of video players just have to perform some simple adaptations, like changing the codec’s attribute when creating the SourceBuffer; and, if the underlying browser supports HEVC decoding (most likely done by a hardware decoder), then you will be able to watch your HEVC MPEG-DASH streams in HTML5! We’ve successfully tested with browsers, such as Microsoft Edge, which comes with HEVC support. Also, Google recently announced support in its Chromium browser. Nevertheless, HEVC is not yet available for the vast majority of Internet video assets, and only a few devices are capable of decoding it. And, of course, it is not the only codec in town. The open and royalty-free video-encoding format VP9 (the successor to VP8) aims to have an even better encoding efficiency and is already supported by popular browsers such as Google Chrome and Microsoft Edge, and this codec is compatible with MSE, too. However, we cannot foresee which codecs will find their way into our daily streaming routine. But whether it’s VP8/9, AVC or HEVC, the MSEs and MPEG-DASH are ready! I hope this article has given you a good overview of the state and future of video on the web. The MSEs and EMEs are big steps toward an ecosystem of open standards for video on the web, replacing plugins such as Flash and Silverlight. Furthermore, HTML5 is getting on the platforms of choice in today’s multi-platform world, including desktop, mobile and smart TV environments. Along with streaming standards such as MPEG-DASH, content providers can have a unified video solution across platforms and devices. They can enhance the user experience through adaptive streaming formats, which prevent buffering, decrease loading times and provide the best possible quality for each user’s bandwidth and device situation.